It is essential to remember that medical practices (such as a general practitioner, dental surgery or psychologist suite) are very different to any other workplaces, so it is important that office furniture is chosen carefully. Keep in mind that many of the people visiting such practices are unwell or accompanying those who are unwell, so their comfort should be paramount. In this article, we have explained how you can choose furniture to match. As this is where patients will wait to be seen, it is important that you have made the space as comfortable as possible. Ample seating is a must, but be careful not to overcrowd the room. As sick people are often reluctant to share a couch, this sort of furniture should be invited. Instead, opt for armless chairs that will accommodate everyone (including those who are pregnant and obese). Use coffee tables to store reading materials. This space, often attached to the waiting room, is where patients report upon arrival and before leaving the practice. You will find that more traditional office furniture (such as desks and chairs) is required, as receptionists spend their days on the phone, booking in appointments and speaking with patients. They are also often responsible for patient records, so will require some sort of filing system that is easy to use. The exam rooms are where doctors see their patients. 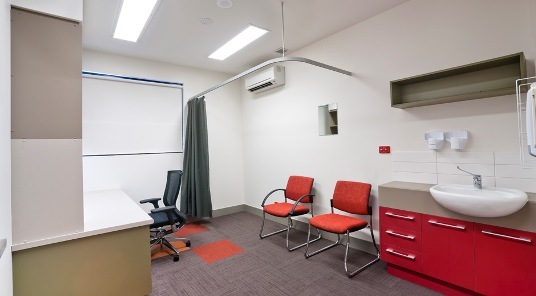 The furniture that is required for these rooms will depend on the kind of practice – a GP, for example, will often need some chairs and a bed, whereas a dentist will actually require a specialist reclining chair. It is important to provide plenty of seating, as the patient will often not attend alone (especially if they’re a child, elderly or severely injured). Depending on the practice, the doctors may have their own offices, which are separate to the exam rooms (which are often shared). Like the reception, these spaces will require more traditional office furniture (such as chairs, desks, shelving and filing cabinets). It is important that you opt for ergonomic pieces, as doctors and other health professionals are likely to spend a lot of time in these rooms over the day. Some medical practices will also have laboratories, which are where tests are performed. They can also be used for the provision of immunizations and other injections, as this means that exam rooms are being freed up for more serious patients. If the laboratory is a place frequented by patients, it is important that seating is provided. Even if it’s not, the lab assistants will require desks and chairs to perform their work. If you are in the process of setting up a medical practice or renovating your current premises, we hope that you have found the above information useful in choosing office furniture that meets your needs perfectly. It is essential that you consider the needs of the unwell people likely to frequent these clinics, as their needs are very different to those visiting other workplaces. At the end of the day, creating a welcoming and calming environment is key.